We mentioned it in our article in Le Petit Banzuke Illustré from July 2007: on June 26th, Takashi Saito, known as Tokitaizan, passed away at his Tokitsukaze heya as a consequence of a massive heart failure. However, since then, shattering revelations and shocking testimonies slowly turned what, at the start, seemed to be a simple tragic event into a sombre tragedy which could well shake Ozumo to its roots. Le Monde du Sumo returns to the affair that pushed Asashoryu and his dancing psychologists into the background. Readers are referred to Le Petit Banzuke Illustré #22 for details about the victim. However, even though some doubts already existed at the time, few expected what the police enquiry finally unearthed. After Tokitaizan's death, the tragic appeal and rather strange circumstances led the press to return to the story during the summer lull. But it was soon completely eclipsed by Asashoryu's affair. Just before that, the family's doubts had surfaced and Tokitsukaze oyakata awkwardly replied to them in a press conference where he mentioned his deshi's past as a small-time addict. More questions were raised when it was found out that the oyakata very quickly offered to send the body to be cremated before any autopsy was done. Police, for their part, made it clear that as far as they were concerned the affair was not finished and that they would probably summon Tokitsukaze and certain deshi again. Here are the latest developments as they were reported in the press, awaiting the official results of the enquiry. On September 26th, it all accelerated on a legal front. The Japanese police announced that they possessed enough clues to continue the investigation and open a full enquiry, clearly for criminal negligence. After numerous hearings and testimonies, which were also published in the press, we can reconstruct the following sequence of events leading to the death of the young deshi who felt uneasy in his heya and wanted to leave. On June 25th, around 11 a.m., young Tokitaizan ran away from his heya. Several of his ani-deshi (elder heya-mates) found him soon afterwards in a neighbouring store and brought him back by force. His comrades then inflicted a chastisement on Saito. The same evening he was forced, as a punishment, to kneel behind the oyakata who yielded to one of his bad tendencies, namely drinking a lot of beer. When young Tokitaizan asked forgiveness, oyakata replied "Shut up! 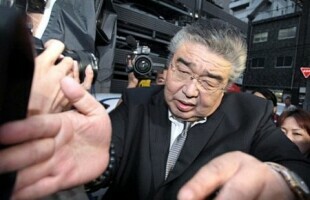 It is decades that I've been in sumo, and I have never seen someone with so little guts". After the meal, Tokitsukaze oyakata - who is claimed in quite numerous rumours to be a bad drinker - finally violently and repeatedly hit young Saito with a beer bottle he had just emptied. He notably hit him on the forehead and the young deshi started bleeding. Oyakata then left him in the "care" of his ani-deshi who would carry on with the punishment. "You show him as well!". Three rikishi rose and took Saito outside. He was severely beaten by bare fists and a baseball bat for more than thirty minutes. Then he was brought back and forced to apologise in front of the oyakata. This was already over the limit of acceptable maltreatment, but it was the events of the next day that caused the final result. At the end of the traditional training session that started at 7 a.m. for which Tokitaizan did not get up, a kawaigari séance took place. This Japanese expression originally means the love for those closest to you, but in professional sumo it is used to describe very physical favouring in training, during which a rikishi is forced beyond his physical limits. The goal is to push a weaker wrestler to rise to greater strength, both psychologically and physically, which he would not be able to manage on his own. Therefore, the elder wrestler often has a real respect and hope for the wrestler on whom he's unleashing the punishment. Besides, kawaigari is generally inflicted on very promising wrestlers. For example, Asashoryu was known to regularly give this "love" to Asasekiryu, whom he considers as a brother, because the yokozuna wants more than anyone for Asasekiryu to overcome himself and reach the top. Kawaigari is a part of sumo essence, even though it may come as a shock to unaware spectators and a part of sumo it will remain. It led to the creation of a number of former sekitori and even yokozuna, for example Hokutoumi who was nourished by Chiyonofuji's "love". To be meaningful, kawaigari has to be adjusted to the strength of the wrestler that receives it and it is precisely this sort of thing that an oyakata should be attentive to during training. On the morning in question, it was a session of butsukari-geiko, pushing exercises, which served as kawaigari. But while a normal butsukari-geiko session lasts a dozen minutes at most, being very exhausting in itself, Tokitaizan was forced to push for more than an hour and he was hit every time he collapsed. Oyakata left the training to take a bath, leaving the rikishi to continue the session. When he returned he dismissed his rikishi and followed them out. Twenty minutes later, Tokitaizan was heard letting out a long moan. At around 12:30 he lost consciousness and his body turned completely pale. Several rikishi tried to rouse him by throwing water on him and spoke of calling an ambulance, but the oyakata only reacted twenty minutes later. The young rikishi was taken to a hospital, but his death was declared there at 14:10. Two days later the oyakata summoned his minarai deshi (from non-salaried divisions) to his room and ordered them never to mention the fact that he hit Tokitaizan with a beer bottle or the use of a baseball bat. From then on he called them back every day to explain what exactly they should say to the police in case they were interrogated. However, when one of his deshi let him know that he admitted the use of the bat (it was Tokinoumi, who has since escaped from the heya), the oyakata was severely shocked. So this was the sequence of events leading to this dramatic story; but what already seemed to be a tragic situation takes a darker turn when you consider the latest developments. They tend to show that the oyakata attempted to cover what is, according to Japanese law, equivalent to unintentionally causing death by grievous bodily harm and punishable by two to fifteen years imprisonment. Oyakata had gone as far as to propose to the family that he would take care of the cremation, before the autopsy. Such behaviour, at the same time as the instructions given to the deshi, implies that the oyakata had realised that it was criminal negligence on his part, since he is the one charged with the well being of his deshi and bears responsibility for them in front of their parents. It was this behaviour that awakened the mistrust of the family, who refused the suggestion. When they received the body, Saito's father was shocked to discover the entire body of his son covered in bruises left by multiple hits, marks of cigarette burns and the gash on his forehead consistent with oyakata hitting him with a bottle. At a press conference held on September 28th, a tearful Mr. Sato explained that he had sent his son to a heya in desperation, not knowing what to do with the attitude of a difficult child. In Japan, sumo is often considered as a sort of military school; an environment where solid "educational" virtues make it possible to return recalcitrant children to the right path. In tears, Mr. Saito added that his son had begged him to take him back, but that he told him to hold on for one more basho. 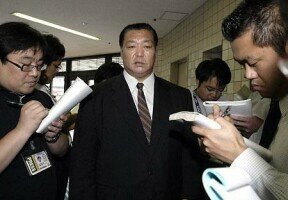 -	NSK should introduce persons who are outside the sumo-world to the committee, created the day before in order to overview the manner in which rikishi are instructed and lead (the committee in question will include, among others, Isenoumi, Hasegawa and Tomozuna oyakata. Other members to be nominated later). Pestered from all sides, Kitanoumi rijicho, even if he did not completely let go of Tokitsukaze oyakata who continued to claim that it all happened in the course of a normal keiko (training), declared that "things have gone too far [...]" and that "an exemplary verdict is necessary". Questioned about a possible resignation, rijicho obscurely responded that "it is not for [rijicho] to tell him what he should do. He should take the responsibility and decide on his own." As if things were not already complicated enough for Tokitsukaze oyakata, testimonies such as the one from a former deshi of his - most probably Shushinzan - surfaced. The deshi also spoke of, to say the least, violent education methods of the oyakata. Accusing him of a guilty penchant for drink, among other things, which led to other deshi being hit with beer bottles and also of having hit him with kitchen utensils on several occasions. Oyakata even supposedly asked this deshi's family to repay the cost of his upkeep after his intai. The epilogue of this very distressing affair came on October 5th. On leaving the rijikai (meeting of the managing committee of the NSK), Kitanoumi rijicho announced the decision to dismiss Tokitsukaze, former komusubi Futatsuryu (29 basho in makuuchi) from all of his functions. In other words, he was evicted from the Kyokai since he did not have the courage - or the dignity - to resign in the face of "grave and consistent" indications of his overwhelming responsibility for this drama. 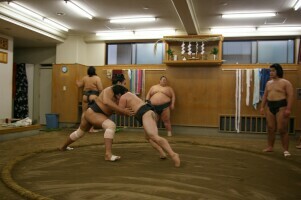 This was the first time that such a measure was taken by leading powers of Japanese professional sumo. 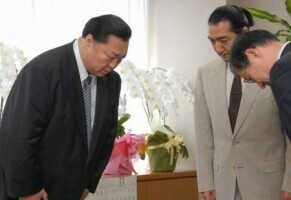 His successor will be maegashira Tokitsuumi, who announced his intai in order to take the reins of the heya. Tokitsuumi is a Nogyo University graduate, just like his original shisho, former ozeki Yukatayama and former Tokitsukaze. Besides, he owns Nishikijima myoseki (elder stock), which he would exchange with Tokitsukaze kabu of the dismissed oyakata (who would then be able to sell the Nishikijima stock and so use the money to leave the sumo world). A human drama was played out. A man whose responsibility was to take care of a young boy, to make a solid wrestler of him at the same time as instilling into him a body of values called sumodo, failed in his mission. That young boy paid for the failure with his life. It is now left to determine all the different responsibilities. If there is no doubt of oyakata's responsibility, at least moral if not direct, it is still left to the police and the NSK to establish the exact circumstances and the responsibilities of other deshi in this unleashing of violence which ended so badly. If the heya's sekitori (Tokitenku, Toyonoshima, Tokitsuumi and Shimootori) have not been implicated yet (they were not present at the time of the events), either actively or passively (which would seem surprising, considering the closeness which reigns in a heya), then they are conceivably at risk of being found responsible by law for not aiding a person in danger. Besides, it would not be surprising if the law was to take a closer interest in the more recent history of professional sumo and above all in some incidents which took place in the past. One could also imagine numerous repercussions for leading powers in sumo. Although rijicho refuses to consider resignation, claiming all responsibility is on Tokitsukaze's part, it seems probable that he will feel the consequences of this affair in the next rijikai elections and be replaced by a new rijicho.